Window tinting improves comfort in every room of the home, helping you refine your space without confining it. At Carolina Solar Security, our 3M™ Window Film minimizes the sun’s wear, protecting your floors, furniture, and curtains without obstructing your view. You can also select a decorative window film that adds privacy and texture to the glass. These high performance-window films are a clear choice for improving energy conservation, protecting your home, and keeping your family safe and comfortable. Several hundred layers of optical film – thinner than a single sheet of paper – can significantly reduce heat and UV rays. The Prestige Series is one of the greatest advancements in the window film industry. Leaving windows crystal clear or lightly tinted, this film protects the space and all its furnishings while allowing more light to enter the home. The Prestige Series performs best when the sun is high during the hottest parts of the day, blocking 66% of heat from penetrating the window. Its lower reflectivity enhances the beautiful views, inside and out. By rejecting up to 80% of the sun’s heat and 99% of UV rays, advanced ceramics give your home the protection it needs while the film maintains its color and appearance for the look you want. With a variety of tint levels that meet your needs, this film helps reduce fading on your favorite furniture or wood flooring. It’s also scratch resistant so you can enjoy clear views. This medium-to-dark shaded film provides better sight at night in a cooler, more comfortable environment. The Night Vision Series blocks up to 78% of the sun’s heat and 99% of harmful UV rays. The low interior reflectivity lets you enjoy the views outside your home at night but preserves privacy in the daytime. Enjoy watching TV or working on the computer with significant glare reduction and eye discomfort so you can work or relax around the clock. Thinsulate™ window film works nearly as well as adding another pane of glass. Designed for year-round climate control, this film keeps your home energy efficient and enjoyable – no matter if the weather is frightful or delightful. 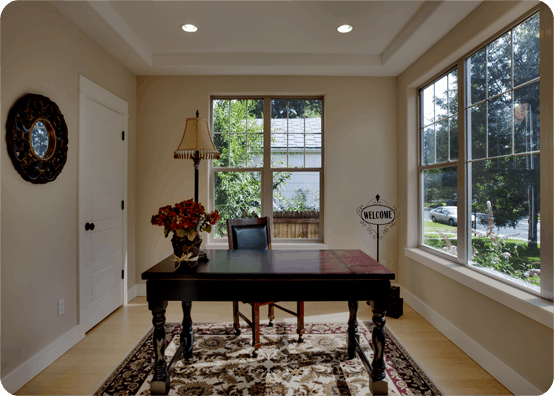 Low-e films are nearly invisible, leaving the views from your favorite windows unchanged. They retain heat in the winter and protect against the sun in the summer, much like insulation. And the guaranteed year-round savings will insulate your wallets, as well. Windows don’t have to be vulnerable in the face of break-ins or severe weather. Our 3M™ safety and security window films are designed with a thicker adhesive that holds glass fragments together, preventing injury from flying glass and creating a strong barrier that deters criminals. This added layer of security can be combined with the Prestige Series or Night Vision Series for even more protection from the sun. Keep dangers out and keep your family and furnishings safe. Create beautiful glass designs that enhance the aesthetic and the improve privacy of your home or garage. Once applied to glass doors or window, the Fasara™ series takes on an etched, sand-blasted, or treated appearance that is subtle yet sophisticated. Let natural light shine in rooms large or small, or in areas where you desire increased privacy, like showers, entryways, or partitions. Choose from a variety of looks and patterns – matte or crystal, frosted or textured. These films are fingerprint resistant for easier cleaning and offer a timeless solution for easier styling. We make finding the right window film for your home simple and affordable. Not to mention our premium manufacturer’s warranties are assigned to all of our products. 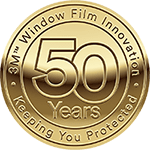 As the area’s largest and most experienced authorized 3M™ dealer, Carolina Solar Security stands behind the protection and performance of our window films.